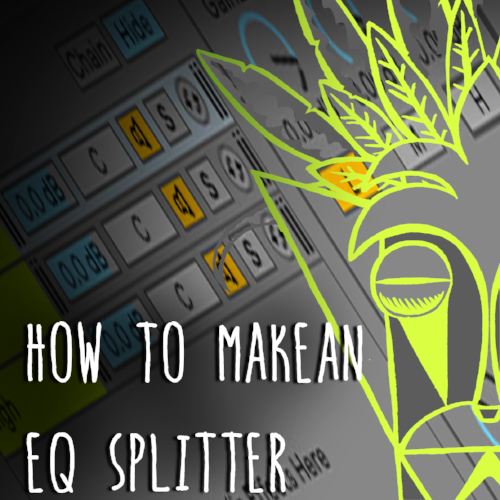 An EQ splitter is a very very useful tool which can allow you to split your frequency bands and add individual processing to each of these bands. In this blog post, we are going be looking at how to set this up in Ableton Live 10 using the audio racks. Start with loading an EQ 3, of course, can if you want to use your EQ 8 or any of your favorite EQ’s but for this example lets keep things simple with 3 bands. Once you have your EQ 3 in place right click on the name plate of the EQ and choose group. Now open up your chains this will allow us to add more layers to this audio effects rack. From there let's duplicate the chain 3 times so we have 3 EQ's. With your EQ’s in place name each chain Low, Mid and High and while we are at it lets set each chain EQ band. In the EQ 3 you will see a Low, Mid and High kill switch. On your low chain just have the Low light up and in the Mid the Mid Light up and so on. That is our EQ splitter set up now we can look at a great use for it. One great way to use it is to add reverb to bass where you have an huge amount of frequencies but do not want to muddy up your low end. Open up your high chain and drop in your reverb audio effect. First make sure the EQ section the reverb is switched of and set your dry/wet to just bellow 50% so we have more direct signal than wet. We will set the size and decay to a a medium value size. As you can hear with this splitter we can have full control of our reverb and what frequencies it is added to. This is great for any time based effect like delay, chorus, flanger and phasers. This technique will work a lot of sound and can be used with a lot of different audio effects in place of the reverb. Stay tune for our next how to blog post where we look at beefing up our drums.